The party at Manhattan’s Intrepid aviation museum was over the top even by hedge fund standards: While some guests sampled caviar and $200-a-bottle cabernet, others took turns test-driving a Rolls-Royce. But the real attraction was jet maker Bombardier’s latest toy for gazillionaires–a sleek long-range Learjet 85, parked behind a velvet rope. The jet retails for about $18 million, which doesn’t include a six-figure tab for annual upkeep. Few of the assorted guests that night could afford to fly the 85 home, but that didn’t trouble the party’s host, Bombardier’s Flexjet subsidiary. It wanted all in attendance to know that its jet card would let them fly free of TSA friskings, boorish seatmates, and bad food for about what they’d lay out for a new luxury car. Jet cards work a lot like debit cards: You make a deposit–anywhere from $35,000 to $100,000–which gives you access to the operator’s fleet. Each trip is charged against the balance in the account, and the cost of the ride varies depending on the type of plane you want and how many people come along. (The cost of a three- or four-hour trip in a seven-seater starts at about $11,000, or $1,500 per person–not a huge premium over first class.) Virtually all of the companies selling jet cards offer a full refund at any time to purchasers who decide to cash out. 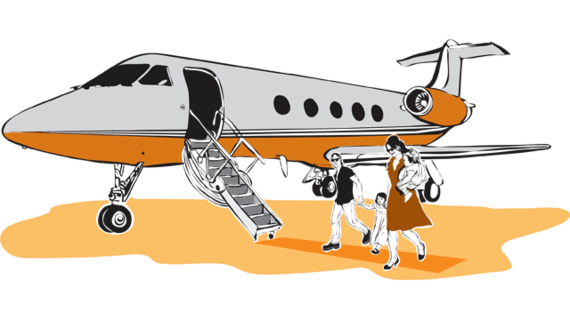 via Flying Private Is More Affordable Than You Think | Conde Nast Traveler.